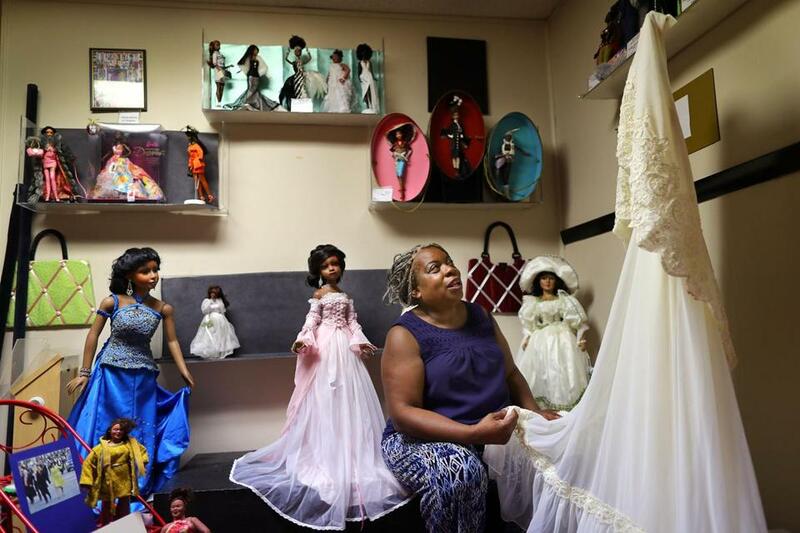 The National Black Doll Museum in Mansfield has more than 6,000 dolls of color, including these Shindana figures made not long after the 1965 Watts riot in Los Angeles. 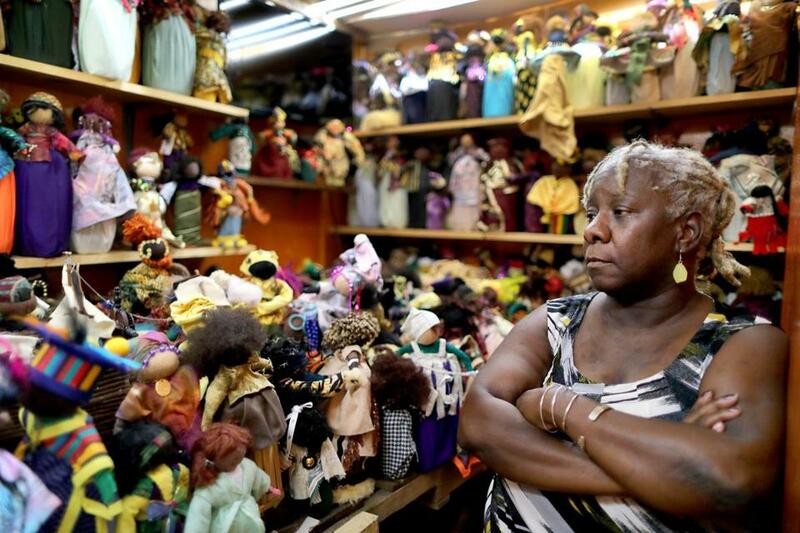 The National Black Doll Museum in Mansfield is the only such museum in America. It’s a small space and irregularly shaped: 3,500 square feet of nooks and crannies, all chock-full of a rotating collection of more than 6,000 dolls. There are apple heads, wishbone, walnut, and thimble dolls; topsy-turvy dolls, one side a white face and white body, the other side black; praying twin dolls from Nigeria; South African Zulu dolls that evoke earth, wind, and fire; Ndebele courtship dolls, also from South Africa; Mattel’s Black Barbies; a singular Bob Marley; Barack and Michelle Obama bride-and-groom dolls; and thousands more. 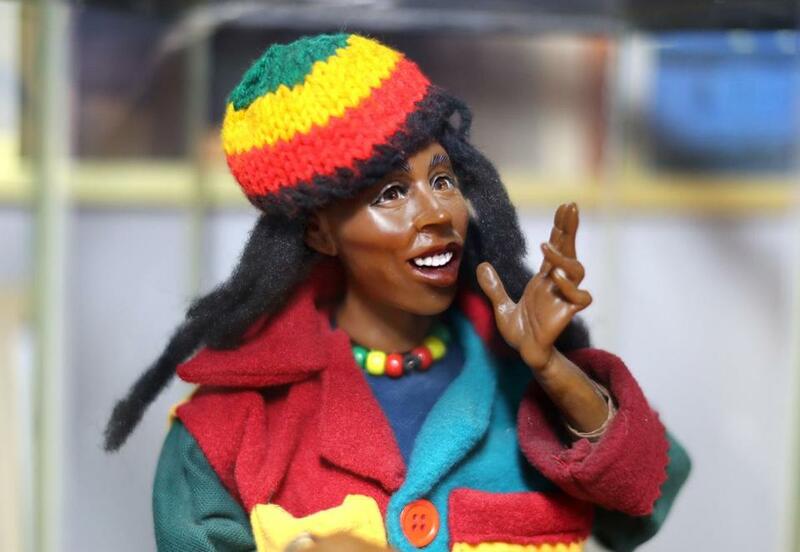 A Bob Marley doll with Marley's real hair. Dolls are playthings. But like statues and monuments, including the Confederate ones lately being removed in droves across the nation, they also embody ideals, identity, and cultural history, values that young children will carry into adulthood. In a gallery with a mirror that runs across one wall, photographs and sketches pay tribute to Americans whose contributions to science, politics, art, and culture should have been recorded in the history books — but weren’t — because they had black skin. 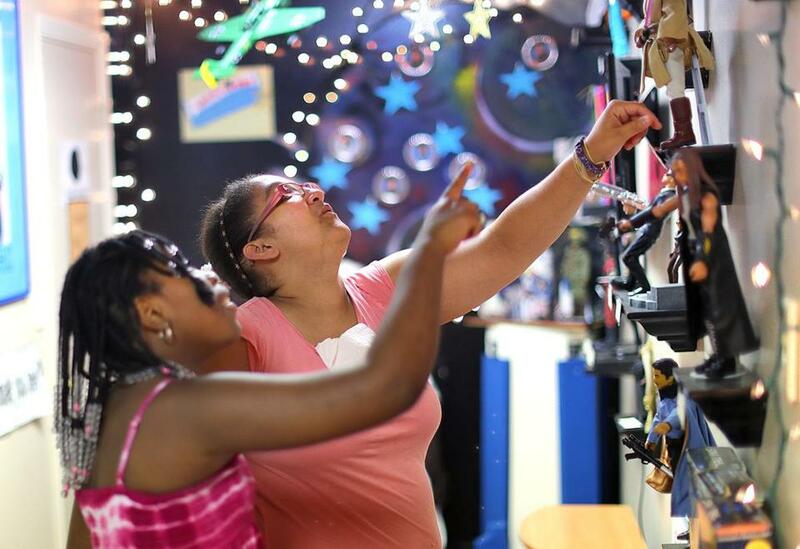 Chaundra Butler, 11, (left) and Jessica Gomes looking at a doll display in the National Black Doll Museum. George Grant, a dentist and inventor who was the first African-American professor at Harvard. Mary Elizabeth Bowser, a former slave who was a Union spy during the Civil War. Jack Johnson, who at the height of Jim Crow became the first African-American world heavyweight boxing champion. They never knew this happened. That’s what the visitors inevitably say, after looking at the dolls and reading snippets of their stories. 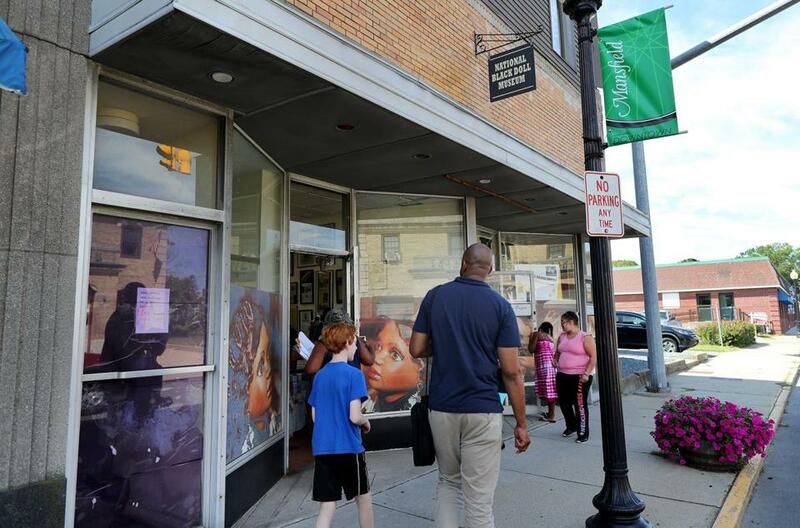 Then, on they go, gazing back at themselves in the long mirror before following footprints made by museum founder Debra Britt, a black woman who dipped her bare feet in black paint to make a path for the self-guided tour. Museum founder Debra Britt with her wedding dress from 1977, among a display of dresses in the museum. For years, the nonprofit museum was a traveling exhibit, more than 5,000 dolls, carried to battered women’s shelters, soup kitchens, and schools; stored in boxes and tubs in her attic, basement, and garage. 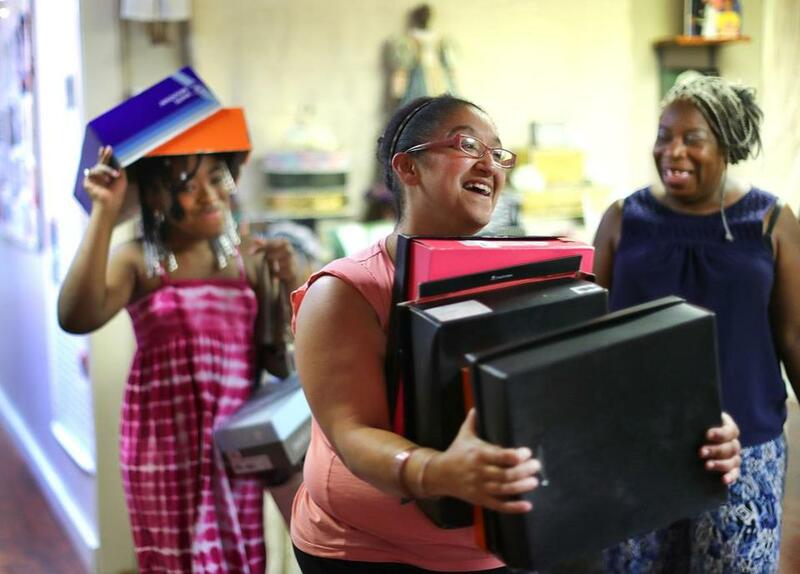 But eventually Britt, 64, who grew up in Dorchester and worked at the South Station post office 21 years, and her two sisters tired of packing and unpacking and lugging boxes around. 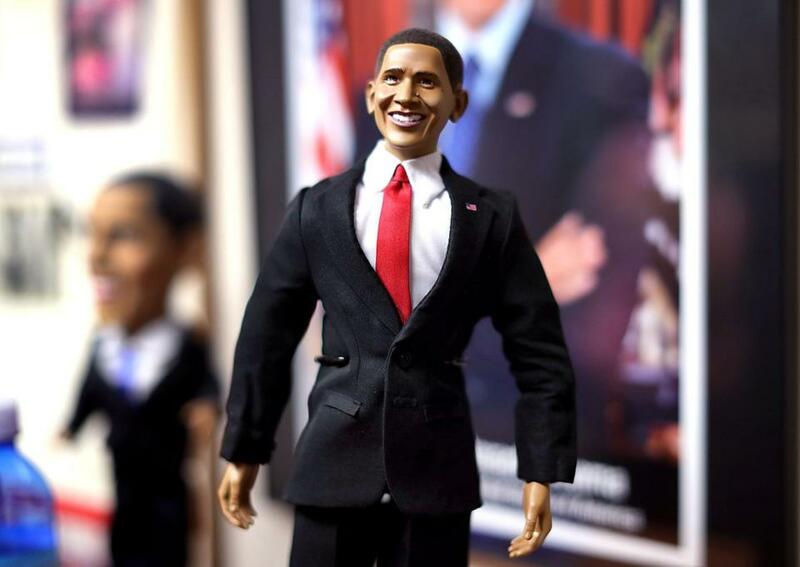 Britt’s husband, a retired Boston police officer, was losing patience as the dolls overtook the couple’s Mansfield home. Five years ago, Britt found a space, a former printing shop on North Main Street, which the museum now rents. 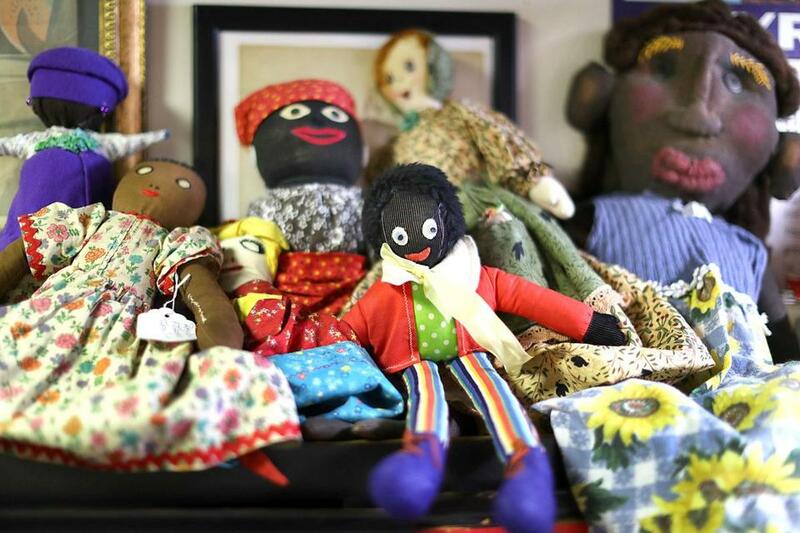 The National Black Doll Museum is on North Main Street in Mansfield. “We thought it would be an asset to the town, a good thing, and we wanted to help,” says Lincoln Todd, who with his brother, Chris, runs the True Value Hardware next door and owns the building. This morning, Britt, her sister Felicia Walker, their friend Carla Butler, Butler’s 11-year-old daughter, Chaundra, and Beth Danesco, who runs the museum’s resident theater company, sit around a table in the craft room, which doubles as an office. 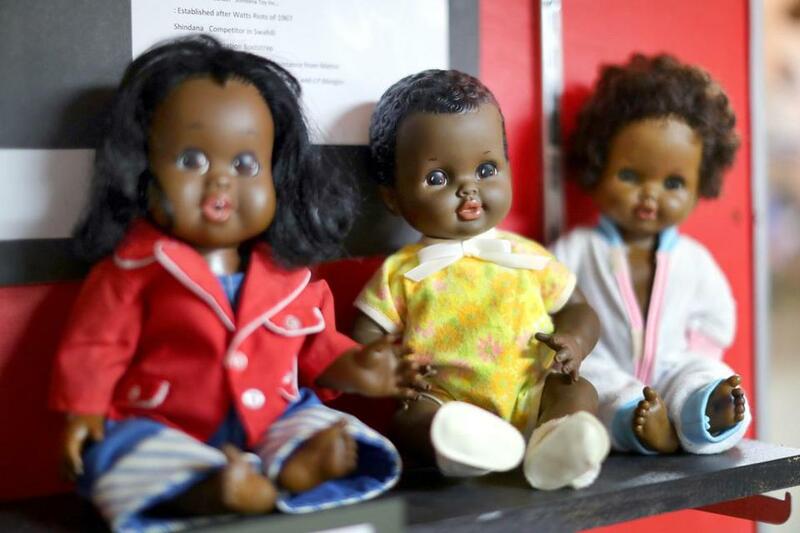 The space is equipped with a sewing machine, fabric, yarn, and recycled bottles — mini plastic ones and glass nips — to be transformed into African wrap dolls for a Christmas display. Felicia Walker, sister of museum founder Debra Britt, in a confined space representing the girth of a slave ship, where some 780 dolls represent child slaves from Africa. This is a place where time and talk ebb and flow like a novel with alternating points of view. Now, the group talks about a YouTube video about national pastors boycotting Sunday football to show support for Colin Kaepernick, a talented quarterback who’s had trouble landing a job after he knelt during the national anthem in support for the Black Lives Matter movement. Soon, the talk turns to Britt’s childhood: one of eight children, the oldest girl, growing up in the 1950s and ’60s in Dorchester near Blue Hill Avenue, and bullied by a teacher at the former Frank V. Thompson Middle School — not the only teacher, she said, to single her out and shame her. But there was also kindness and love and people who steadied her. The night before, while President Trump was stirring up crowds in Phoenix with promises to shut down the government if it doesn’t build a wall, Britt was counting shoe boxes. Volunteers Chaundra Butler, 11, and Jessica Gomes with shoe boxes, as they helped Debra Britt (right) construct a new exhibit. Four hundred promised from Payless Shoes. A smattering of smaller donations from people in the neighborhood. Another 500 or so to go to reach 1,000, the number of boxes she needs to build an interactive exhibit, “Against the Wall,” that will open Tuesday, Oct. 3. What better witness to America’s often turbulent history with newcomers than the dolls that sit behind the wall of boxes, each box bearing the name and photo of a deported immigrant, and inside, the person’s story? So many things have happened and been forgotten. Britt’s path to Mansfield, less than 3 percent African-American in the 2010 US Census, is one such tale. When she was 18, she said, she was violently assaulted by a man in Dorchester, an assault she said crippled her emotionally. She never named her assailant or pressed charges, but when he showed up years later at the post office, she quit. She and her husband and family moved to Sharon, and when the kids were grown, to Mansfield. A group of rag dolls. To her, the dolls are reminders of the past, both good and bad. Chaundra Butler, 11, of Mansfield looking at cutouts of famous people of color. 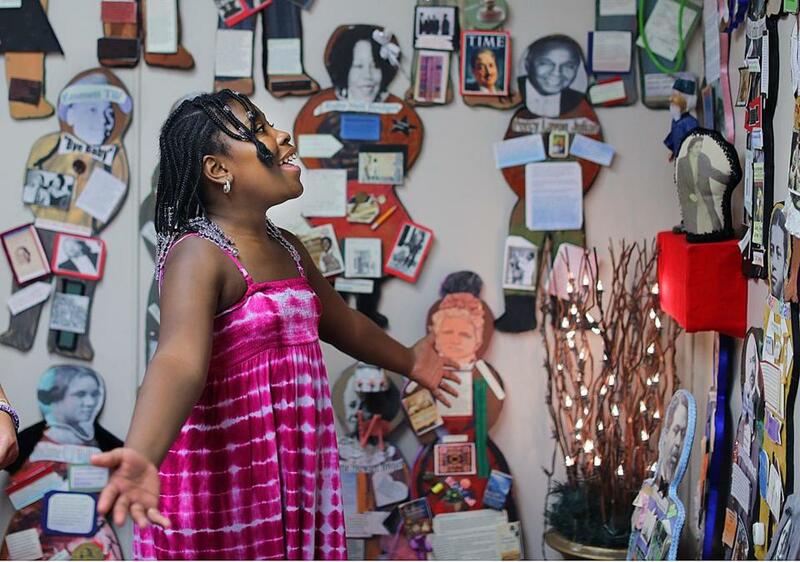 The National Black Doll Museum, 288 North Main St., Mansfield, is open Tuesday through Saturday, noon to 5 p.m. Admission is $13; seniors, $9; children, $6. A reception for “Against the Wall” and the Smithsonian’s traveling exhibit “A Place for all People” is Sunday, Oct. 8. For more information, go to http://nbdmhc.org.